This article updates readers on the most important developments in international arbitration in Australia in the past year. 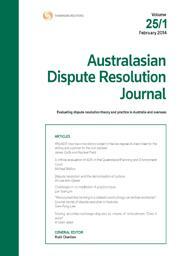 It surveys legislative, case law, policy and other developments in Australia since 1 September 2011. Prior to initiating litigation, parties should negotiate in order to limit the issues in dispute and avoid a costly court process. But what does it mean to negotiate? Historically the common law conditioned negotiation at a good faith standard – requiring parties to turn their minds to the issues in dispute and enter the process honestly and willingly. However, this standard proved difficult to grasp and many jurisdictions have since enacted legislation designed to formalise the process. This article examines the latest enactment – the Commonwealth formulation, which requires parties to “take genuine steps to resolve disputes” and compares it to both the New South Wales formulation, which requires parties “to take reasonable steps” and the common law good faith standard. This analysis will demonstrate that the concept of genuine steps formalises the common law approach, and as opposed to reasonable steps, more accurately achieves the object and purposes of alternative dispute resolution processes. Fourteen parents who had undertaken child-inclusive mediation, and a comparison group of 19 parents who had engaged in mediation without their children being involved, were asked about their views on utilising child-inclusive mediation to assist in the resolution of their disputes concerning parenting arrangements after separation. Most of the comparison group had not been offered the option of child-inclusive mediation either because it was not available in their area, or because the children were too young, or for other reasons, but would have chosen it had it been offered. Parents gave five reasons for wanting child-inclusive mediation. These were: the therapeutic benefit for the children in talking to someone; finding out how the children were feeling; giving the children a voice in the resolution of the dispute; to gain assurance that what the child was saying to that parent is the same as he or she would say to an independent person; and helping the other parent to hear what the child wanted. This research demonstrates the importance of providing clear explanations to parents about the purpose of child-inclusive mediation. One of the major concerns raised by people using negotiation processes is about the fairness or justice of the process. Individuals undertake negotiation to derive better outcomes than would otherwise occur, which requires them to engage in interest-based negotiation. But interest-based negotiation focuses upon the interests of the disputants rather than any objective legal measures of “fairness” – that is, legal justness, not the more commonly accepted negotiation concept of meeting the interests of all parties equally. It is vital to investigate how to develop measures, or at the very least principles, for the construction of legally just negotiation support systems. This article discusses processes that, when applied, will encourage fairness and justice in the development of negotiation support systems. Such processes include providing enhanced transparency, supporting bargaining in the shadow of the law, and allowing for limited discovery. Judicial mediation has occurred in the Indonesian legal system since court-annexed mediation was established in 2003. To date, judges have dominated the role of court-annexed mediators because civil procedure law mandates that they attempt to settle disputes amicably through mediation prior to litigation and their mediation services are free. Court-annexed mediation was introduced to overcome a case backlog problem in the Supreme Court and to provide a faster, cheaper and simpler approach to dispute resolution. However, since its establishment, judicial mediation has not been popular amongst judges and lawyers, or effective in settling civil disputes. The authors contend that judicial mediation could be an effective approach to settling some civil disputes amicably under certain conditions. However, judicial mediators must be provided with incentives and undertake ongoing accredited education and training in order to have the appropriate mediation knowledge and skills within a framework of specified standards. Customary arbitration is part and parcel of indigenous African societies and its influence is notably recognised in Nigeria. This practice of referring disputes to the family heads or elders for decision is deeply rooted in Nigeria and on many occasions such disputes between one community against another community are usually referred to a delegate court made up of representatives of both communities for settlement. However, it is noted that 80% of all cases in customary arbitration in Nigeria originate from the Ibo community of the eastern part of the country, upon which the appellate courts base their decisions on cases coming from other parts of Nigeria. The system is open to criticism due to the changing pronouncements of the Nigerian appellate courts by imposing the validity tests of customary arbitration of the Ibo community on the Yoruba of the south western Nigeria. This article will examine just how customary is customary arbitration in Nigeria, along with other areas of uncertainty in its practice. For the pdf version of the table of contents, click here: ADRJ Vol 23 Pt 4 contents.